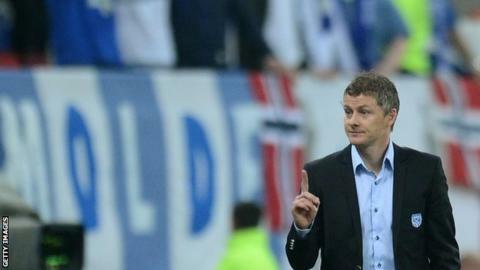 Molde coach Ole Gunnar Solskjaer says he is in no rush to manage a club in the Premier League. Solskjaer, who scored the dramatic winning goal that gave Manchester United the 1999 Champions League and the treble, has led Molde to unprecedented success, winning the last two Norwegian titles. He turned down the Aston Villa job in May 2012 and was heavily linked with Blackburn Rovers earlier this season. But he says that, for the moment, family life is more important than ambition. "We've decided that, as a family, we'd still like to live in Norway," he told the BBC's World Football programme. "At that time it was too early to move back. I've moved back home and the kids and my family are enjoying themselves." When he does eventually spread his wings, the 39-year-old Solskjaer says his gaze will always be directed towards the club where he made his name, scoring 91 goals in 235 matches. "I think every player who's played for Man United and has a manager in them would love that as the ultimate goal, and that's of course my ultimate dream. But I'm not sitting here saying it's realistic. Solskjaer, who says the biggest highlight of his United career was scoring both goals in a 2-0 win over Newcastle in 2006 in front of his son, says he still has a way to go before being qualified enough to replace Sir Alex. "To play under him is inspiring and motivating because he's such a great man manager. He manages your life, he manages your career with respect and with an ultimate aim of improving and winning. "You were afraid of letting him down. That's the feeling you get from working under him. You want to do well for him because he deserves it. "When we won the Champions League in 1999, I remember having that feeling of 'he deserves this'. If you have that as a manager I think you've done well." World Football brings listeners up to date with the issues, stories and passion behind the world's most popular sport every Friday on the BBC World Service. You can download the podcast here.